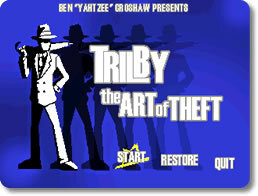 Trilby: The Art of Theft Game - Download and Play Free Version! 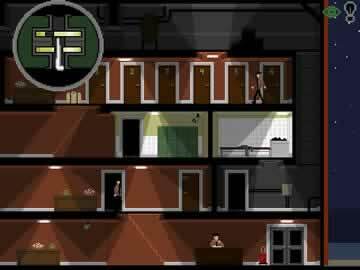 Perform Daring Heists on the Rich In This Stealth Action Game! It is 1991, two years before the events of 5 Days A Stranger and the eccentric British cat burglar Trilby is at large. Distrustful of his fellow man and patently skilled in every aspect of burglary, Trilby is on an ongoing quest to scare the ignorantly rich by hitting them where it hurts - their wallets. Journey with Trilby as he robs the rich to give to himself and hopefully not bite off more than he can chew. Experience daring heists and see how this master thief made his name! 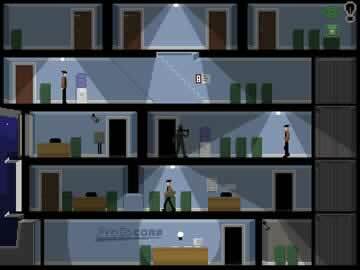 Trilby is full of some rather tense stealth action as you navigate various mansions, dodging guards and alarms systems. The controls are quite simple and mostly revolve around the arrow keys for movement, 'X' to flatten against the wall, 'Z' to use your tazer, and the space bar to move up and down between floors. At the beginning of each heist, Trilby will explain the objectives that need to be fulfilled before he can exit the scene of the crime, usually stealing a sufficient amount of loot. Additionally, being seen, tripping laser beams, or making critical errors will set off alarms and each heist has a maximum number of alarms that can be tripped before Trilby aborts the mission. Guards can be taken out of the picture by hitting them with an electric shock from the tazer, but Trilby dislikes doing this and limits himself to a certain number of shocks per heist before aborting the operation. At the end of each heist Trilby's performance will be graded on the time taken, amount of loot stolen, alarms tripped, and guards tazed. The worst grade you can get is a C, and the best is a Trilby symbol, which denotes a perfect heist. With higher marks, you receive skill points which you can use to upgrade your thieving skills, such as a stealthy roll, lock-picking skills, and wire-cutting. While the controls and main elements might seem simple, the gameplay in Trilby is quite challenging and many players will find it difficult to reach an A rating, let alone Trilby status. The difficulty level of this title is perhaps the only hindrance to new gamers in accessing this fun title, and the difficulty only ramps up as the levels progress. So if you are looking for a challenging stealth platformer, look no further than Trilby: The Art of Theft! Watch a play through of the first level and catch a glimpse of the thieving fun you can enjoy in Trilby: The Art of Theft.